Huashi (GDH) Hotel is located at the business center at Tianhe District, a four-star business hotel, invested by South China Normal University, managed by Guangdong (International) Hotel Management Holdings Ltd., serving our guests with our motto "sincerity, integrity and etiquette". Our hotel owns more than 200 rooms or suites. The Chinese restaurant and the Cafeteria offer 300 and 100 seats respectively. The spacious and bright-lit multifunctional hall can accommodate 300 people for a meeting. It is your best choice for a big meeting. 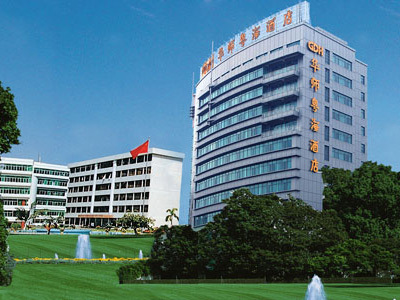 Our hotel is located at an ideal place, with convenient transport, close to Pacific Ocean Computer Center, Tianhe Sports Center and the downtown. It is terminal station of Airport Express No.2B, and only 10 minutes by bus to the Guangzhou East Railway Station or the Pazhou International Exhibition Center. You will enjoy the convenience and pleasure brought to you by our hotel, whether for business, leisure, shopping, sightseeing or participation in an exhibition. 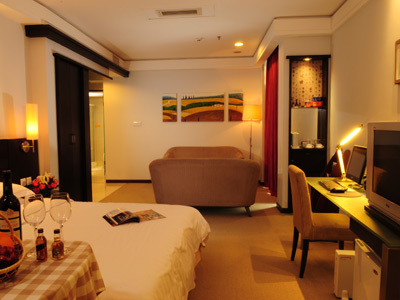 The hotel provides a full range of accommodation choices, including Standard rooms, Superior rooms and Deluxe rooms. All rooms are all equipped with air-conditioning, direct dial telephone, free internet connection and safe.